Experiments that place untethered fish, flies, and mice in simulated environments give clues about the animals’ social behavior. A new virtual reality system allows researchers to control what a freely moving fly sees and study how it responds to its environment. (See full video. )STRAWLAB.ORG/FREEMOVRFlies, fish, and mice can now enter virtual reality (VR) without being tied down. European researchers have developed a set-up for freely moving animals that may offer more detailed insight into how animals’ brains work in social situations. They describe the system today (August 21) in Nature Methods. Straw says VR experiments in tethered animals have been incredibly useful in studying social behavior. But past studies have shown that restraining the animals can yield misleading results. For example, a 2013 study published in Science showed that in restrained-animal VR, fewer hippocampal place cells fire compared to freely moving animals. Called FreemoVR, the new VR system allows scientists to perform precise experiments that investigate how such sensory cues are integrated in the brain, Straw says. 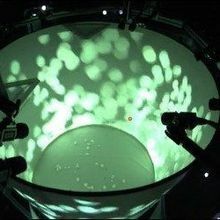 To create the new set-up, Straw and colleagues tracked animals in three-dimensional space while using video-game technology to display an artificial environment. To maintain the relevant viewpoint as the animal moved around in the space, the team carefully calibrated the 3-D shape of the walls and how each patch of wall was illuminated by each projector pixel. 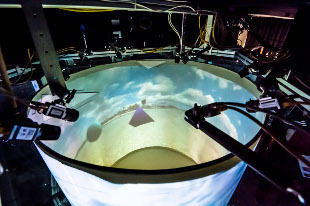 The team tested the virtual worlds on freely moving fruit flies, zebrafish, and mice. 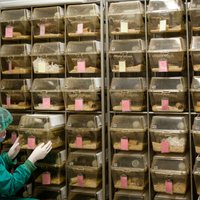 The virtual worlds allowed the team to study mice’s aversion to heights and how zebrafish respond to being swarmed by invaders. The results also show that restrained fly preparations are not suitable for studying the role of head movements in flight control. Card says that with systems like FreemoVR, researchers could change the visual stimuli a fly experiences in real time according to the animal’s behavior. 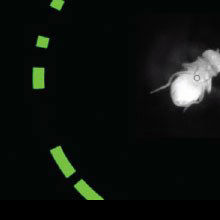 This could help dissect how the fly uses visual information to make behavioral choices. The new system “does a very nice job of implementing freely moving VR,” agrees Albert Lee, also of Janelia, by email. He studies spatial learning in rats and says that the team’s experiment on mice shows the system can effectively simulate 3-D environmental structure from the animal’s point of view. 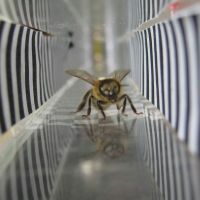 In the experiment, the team tested how mice respond to seeing different floor depths by having the animals walk on a circular track elevated above a checkerboard surface. Mice can sense height by using the relative movement of objects to determine their distance, so checks of the same size move differently if they are farther away. The team created a “static” set-up by placing a television under the circular track. The squares were projected so that the checks didn’t move correctly to reveal a difference in distance. The team then created a VR set-up by changing the projection of the squares so that they moved to give the perspective of being at different heights. While in the static set-up, the animals spent equal amounts of time above different areas of the floor, in both the real world and VR system, the mice spent more time above the flooring that wasn’t as far away. “The animal reacts by showing a real-world-like ‘fear of heights,’” Lee says. J. Stowers et al., “Virtual reality for freely moving animals,” Nature Methods, doi:10.1038/nmeth.4399, 2017.